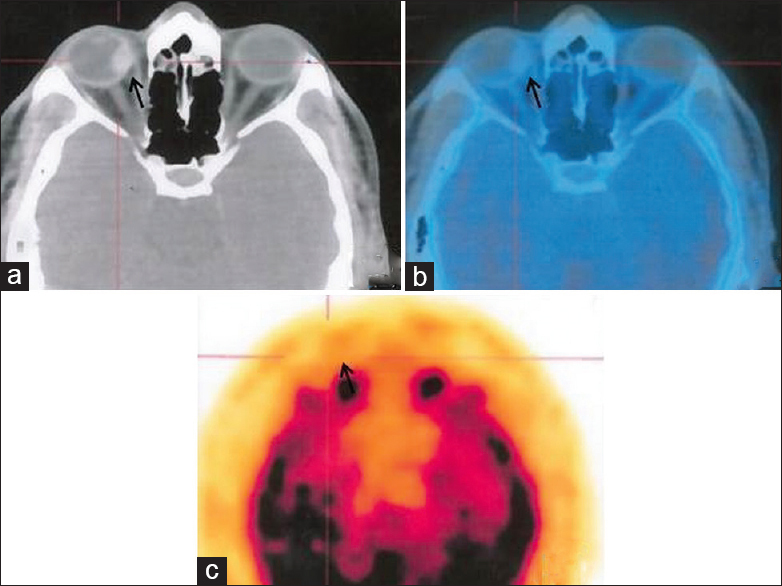 [15O] H2O positron emission tomography (PET) has long been out of use in activation studies on the brain. 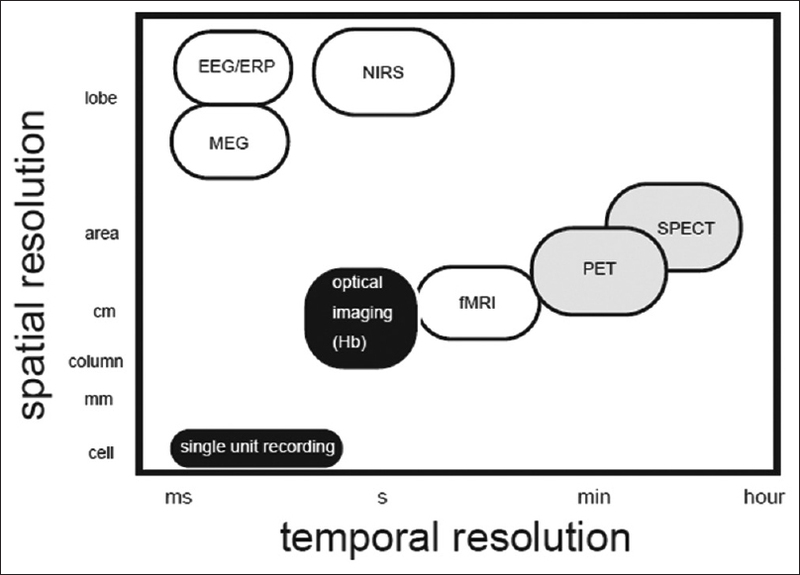 Indeed, it is true that blood oxygen level dependent (BOLD) functional magnetic resonance imaging (fMRI) has better spatial resolution and temporal resolution than PET, as well as no radiation exposure. However, PET and fMRI differ in their scope. Compared to fMRI, [15O] H2O PET offers advantages such as being quantifiable, less deteriorated by movement, and allowing for longitudinal studies. This article aimed to reassess the merits of PET in this context. Tamoxifen is the most prescribed anticancer oral drug for increasing overall survival and decreasing recurrence and the risk of contralateral disease. However, some side effects, such as endometrial and liver tumors, thromboembolic disorders, and drug resistance, are associated with long-term tamoxifen treatment. We assessed the hematologic and organ toxicity after oral administration of three different doses of nanotamoxifen formulations. 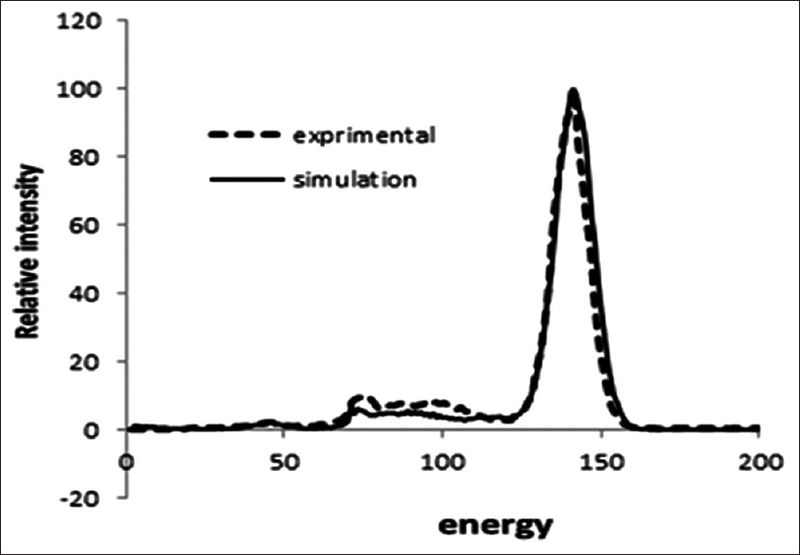 We also performed biodistribution studies of Technetium-99m (99mTc)-nanotamoxifen after intravenous administration. The results demonstrated that nanotamoxifen was well-tolerated, with no adverse effect on biochemical parameters of blood and at the cellular level. Nitric oxide (NO) levels indicated no free radical formation. Oral nanotamoxifen is well-tolerated, with no hepatic or renal toxicity. Intravenous nanotamoxifen has potential to escape the liver, and is known for producing the harmful metabolite 4-hydroxytamoxifen (4OH-tamoxifen), which can cause uterine cancer. The detector is a critical component of the single photon emission computed tomography (SPECT) imaging system for giving accurate information from the exact pattern of radionuclide distribution in the target organ. The SIMIND Monte Carlo program was utilized for the simulation of a Siemen's dual head variable angle SPECT imaging system with a low energy high resolution (LEHR) collimator. The Planar and SPECT scans for a 99mTc point source and a Jaszczak Phantom with the both experiment and simulated systems were prepared and after verification and validation of the simulated system, the similar scans of the phantoms were compared (from the point of view of the images' quality), namely, the simulated system with the detectors including bismuth germanate (BGO), yttrium aluminum garnet (YAG:Ce), Cerium-doped yttrium aluminum garnet (YAG:Ce), yttrium aluminum perovslite (YAP:Ce), lutetium aluminum garnet (LuAG:Ce), cerium activated lanthanum bromide (LaBr3), cadmium zinc telluride (CZT), and sodium iodide activated with thallium [NaI(Tl)]. The parameters of full width at half maximum (FWHM), energy and special resolution, sensitivity, and also the comparison of images' quality by the structural similarity (SSIM) algorithm with the Zhou Wang and Rouse/Hemami methods were analyzed. FWHMs for the crystals were calculated at 13.895, 14.321, 14.310, 14.322, 14.184, and 14.312 keV and the related energy resolutions obtained 9.854, 10.229, 10.221, 10.230, 10.131, and 10.223 %, respectively. Finally, SSIM indexes for comparison of the phantom images were calculated at 0.22172, 0.16326, 0.18135, 0.17301, 0.18412, and 0.20433 as compared to NaI(Tl). The results showed that BGO and LuAG: Ce crystals have high sensitivity and resolution, and better image quality as compared to other scintillation crystals. 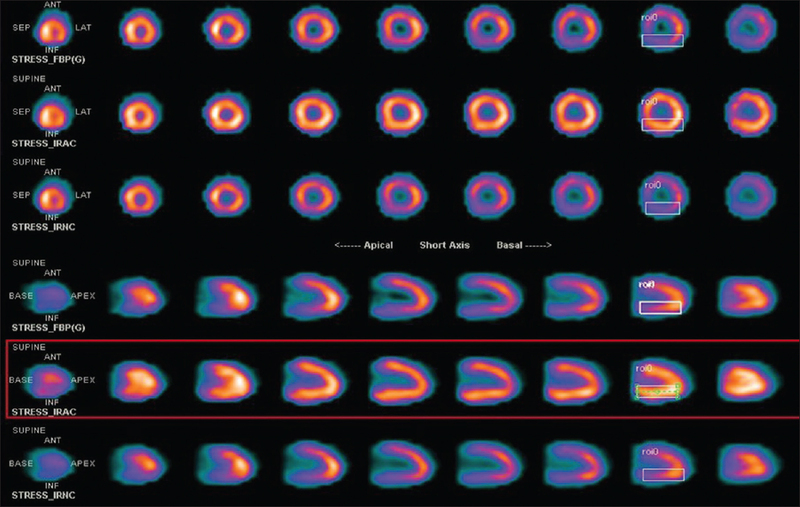 The purpose of this study was to evaluate the diagnostic value of attenuation-corrected single photon emission computed tomography (SPECT) myocardial perfusion imaging (MPI) on the inferior wall compared to uncorrected (NC) SPECT MPI between obese and nonobese patients. 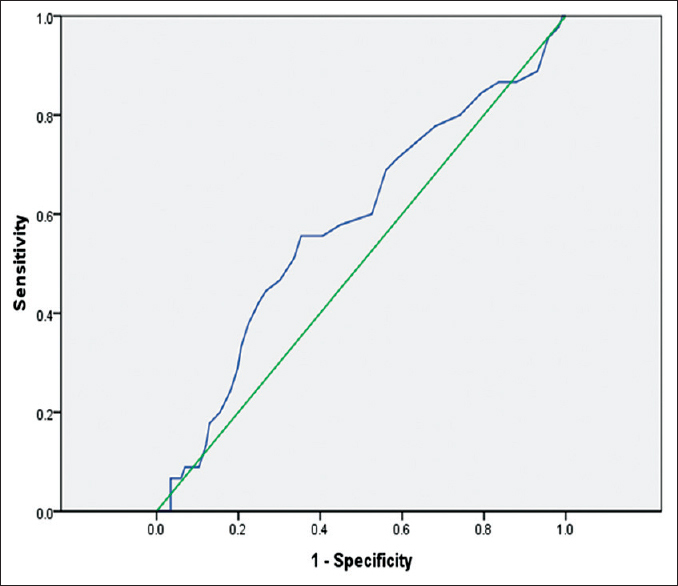 A total of 157 consecutive patients (122 males and 35 females, with median age: 57.4 ± 11 years) who underwent AC technetium 99m-methoxyisobutylisonitrile (AC Tc99m-sestamibi) SPECT MPI were included to the study. A hybrid SPECT and transmission computed tomography (CT) system was used for the diagnosis with 1-day protocol, and stress imaging was performed first. During attenuation correction (AC) processing on a Xeleris Workstation using Myovation cardiac software with ordered subset expectation maximization (OSEM), iterative reconstruction with attenuation correction (IRAC) and NC images filtered back projection (FBP) were used. For statistical purposes, P < 0.05 was considered significant. This study included 73 patients with body mass index (BMI) <30 and 84 patients with BMI ≥ 30. In patients with higher BMI, increased amount of both visual and semiquantitative attenuation of the inferior wall was detected. IRAC reconstruction corrects the diaphragm attenuation of the inferior wall better than FBP. AC with OSEM iterative reconstruction significantly improves the diagnostic value of stress-only SPECT MPI in patients with normal weight and those who are obese, but the improvements are significantly greater in obese patients. Stress-only SPECT imaging with AC provides shorter and lower radiation exposure. Hyperthyroidism continues to be a pressing public health concern in West Africa. Its prevalence in Africa has been quoted as 1.2%-9.9%, with Graves' disease as its most common cause. Radioiodine-131 (RAI) therapy of hyperthyroidism recently commenced in two government hospitals in Ghana and Nigeria. This is a retrospective analysis of consecutive patients treated with RAI for primary hyperthyroidism at the National Centre for Radiotherapy and Nuclear Medicine (NCRNM) from 2008-2013, and in the University College Hospital (UCH) from 2006-2013. Cure was defined as euthyroidism or hypothyroidism occurring at 6 months post-RAI. Data were analysed using SPSS version 21 and Epi Info version, categorical data were evaluated with the Chi-square test and Fisher's exact test. 94 patients were studied, aged 20-74 years; 78 were females, and 16 were males. 38 were Ghanaian and 56 Nigerian. The presence of thyroid-associated ophthalmopathy (TAO) made cure less likely (χ2 P = 0.006, odds ratio = 0.118; 95% confidence interval, 0.027-0.518). Other factors assessed proved to be insignificant. Our findings suggest that hyperthyroid patients with TAO will benefit from a higher RAI dose than their counterparts without TAO. The purpose of this study is to evaluate and compare the incidence of hypothyroidism following different fixed radioactive iodine-131 (131I) activities in the treatment of Graves' disease (GD) and to investigate the predictive factors that may influence its occurrence. This retrospective analysis was performed on 272 patients with GD who were treated with 131I, among whom 125 received 370 MBq and 147 received 555 MBq. The outcome was categorized as hypothyroidism, euthyroidism, and persistent hyperthyroidism. Multiple logistic regression analysis was performed to identify significant risk factors that affect the development of hypothyroidism. The incidence of hypothyroidism following the first low activity was 24.8% with a high treatment failure rate of 58.4%, compared with 48.3% and 32% following high activity. The overall cumulative incidence of hypothyroidism following repeated activities was 50.7%, out of which 73.9% occurred after the first activity and 20.3% after the second activity. The higher 131I activity (P < 0.001) and average and mild enlargement of the thyroid gland (P = 0.004) were identified as significant independent factors that increase the rate of incidence of hypothyroidism (Odds ratios were 2.95 and 2.59). No correlation was found between the development of hypothyroidism and the factors such as age, gender, presence of exophthalmos, previous antithyroid medications, and the durations, and Technetium-99m (Tc-99m) pertechnetate thyroid uptake. In view of the high treatment failure rate after first low activity and lower post high activity hypothyroid incidence, high activity is recommended for GD patients, reserving the use of 370MBq for patients with average sized and mildly enlarged goiter; this increases patient convenience by avoiding multiple activities to achieve cure and long-term follow-up. The aim of this study was to evaluate the response and hematological toxicity in peptide receptor radionuclide therapy (PRRT) with lutetium (177Lu)-DOTA-octreotate (DOTATATE) in metastatic neuroendocrine tumor (NET) with extensive bone marrow metastasis at the initial diagnosis. A retrospective evaluation was undertaken for this purpose: Patients with NET with extensive diffuse bone marrow involvement at diagnosis who had received at least three cycles of PRRT with 177Lu-DOTATATE were considered for the analysis. The selected patients were analyzed for the following: (i) Patient and lesional characteristics, (ii) associated metastatic burden, (iii) hematological parameters at diagnosis and during the course of therapy, (iv) response to PRRT (using a 3-parameter assessment: Symptomatic including Karnofsky/Lansky performance score, biochemical finding, and scan finding), (v) dual tracer imaging features [with somatostatin receptor imaging (SRI) and fluorodeoxyglucose-positron emission tomography/computed tomography (FDG-PET/CT)]. Based on the visual grading, tracer uptake in somatostatin receptor (SSTR)-positive bone marrow lesions were graded by a 4-point scale into four categories (0-III) in comparison with the hepatic uptake on the scan: 0 - no uptake; I - clear focus but less than liver uptake; II - equal to liver uptake; and III - higher than liver uptake]. Hematological toxicity was evaluated using National Cancer Institute (NCI)-Common Terminology Criteria for Adverse Events (CTCAE) version 4.0 score. A total of five patients (age range: 26-62 years; three males and two females) with diffuse bone marrow involvement at the diagnosis was encountered following analysis of the entire patient population of 250 patients. Based on the site of the primary, three had thoracic NET (two patients bronchial carcinoid and one pulmonary NET) and two gastroenteropancreatic NET (one in the duodenum and one patient of unknown primary with liver metastasis). Associated sites of metastases included the liver (n = 5), breast (n = 1), and aortocaval nodes (n = 1). On baseline diagnostic study [68Ga-DOTANOC/TATE or the technetium (99mTc)-hydrazinonicotinamide (HYNIC)-tektrotyd (TOC)], tracer uptake in the bone marrow in all patients was Grade III. At the time of analysis, the patients received three to four cycles of PRRT and a cumulative dose of 16.1-25.6 GBq with a follow-up duration ranging 10-27 months. The response as assessed by three parameters: (i) Symptomatic: All patients (except for one) reported excellent symptomatic palliation and better quality of life with improvement of Karnofsky/Lansky scores; the single case with nonresponse had shown symptomatic response in the initial 6 months following which he had a progressive disease and death at 18 months (ii) biochemical: Three patients had shown more than 50% reduction in the serum chromogranin level, one had shown increase but had demonstrated clinical evidence of response with radiologically stable disease while the other who had shown slight increase of chromogranin A (CgA) level had shown progressive disease thereafter (iii) radiological: Three patients demonstrated partial response (on FDG-PET/CT), one patient had stable disease and one patient had progressive disease following initial clinical response. As per the NCI-CTCAE score, only one patient had persistent Grade I anemia without any deterioration with the administered dose at the time of analysis. FDG uptake in the bone marrow metastatic lesions showed no obvious FDG avidity on visual assessment except for two patients (low-grade FDG uptake). Interestingly, the associated metastatic lesions [except for patient I with Mib1 labeling index (LI): 1-2%], demonstrated high FDG avidity. Thus, we observed that the majority (in our series four out of five patients, i.e. 80%) of the patients had excellent symptomatic response with at least stabilization of the disease at a follow-up period of 10-27 months. The single patient who had a progressive disease also had a good symptomatic response in the initial 6 months from the first dose of PRRT. Despite the extensive bone marrow involvement, no hematological toxicity was observed (only one patient showed Grade I anemia), suggesting that PRRT is well-tolerated by this particular subgroup. Many patients with hepatorenal syndrome (HRS) end up receiving a combined liver and kidney transplant (CKLT) with preservation of native kidneys, specially type 1 HRS since is characterizes by a very rapid deterioration of renal function. Eventually, most of the patients regain renal function, but it is unknown if this is due to the transplanted kidney, the recovery of native renal function, or both. The aim of this study is to evaluate if there is recovery of native renal function in patients with HRS following CKLT. 22 patients (16 men; 6 women) with history of HRS and status post CKLT were studied. Mercapto-acetyltriglycine-3 renograms in the anterior and posterior views with the three kidneys in the field of view were simultaneously acquired. The renograms were analyzed by creating regions of interest around the transplanted and native kidneys. Relative contribution to the renal function, clearance, and effective renal plasma flow for the transplanted and native kidneys were obtained. 1/22 (4.5%) patients presented with a very poor functioning transplanted kidney, in 15/22 (68%) cases the combined native renal function was markedly poorer than the transplanted renal function and in 6/22 (27%) native kidneys showed a contribution to the renal function similar to the transplanted kidney. In conclusion, our series show that around 32% of the HRS patients recovered their native renal function after CKLT. Identification of common factors that affect recovery of native renal function may help to avoid unnecessary renal transplants, significantly reducing morbidity and cost, while facilitating a reallocation of scarce donor resources. Adamantinoma is a rare locally aggressive osteolytic tumor that is found 90% of the time in the diaphysis of the tibia with the remaining lesions found in the fibula and long tubular bones. A case of adamantinoma of the tibia is presented. 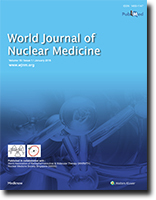 The added value of nuclear medicine investigations in the workup of this patient is described. A three-phase whole body 99mTc-methylene diphosphonate bone and a whole body 99mTc-methoxy-isobutyl-isonitrile scans were complimentary in the demarcation of viable bone tumor and the assessment of the remainder of the bone and soft tissue to exclude other sites. Intra-operative assistance with a hand-held gamma probe, guided the biopsy of the most metabolically active tumor tissue. Histology revealed a biphasic tumor composed of epithelial and fibrous components, in keeping with an adamantinoma. 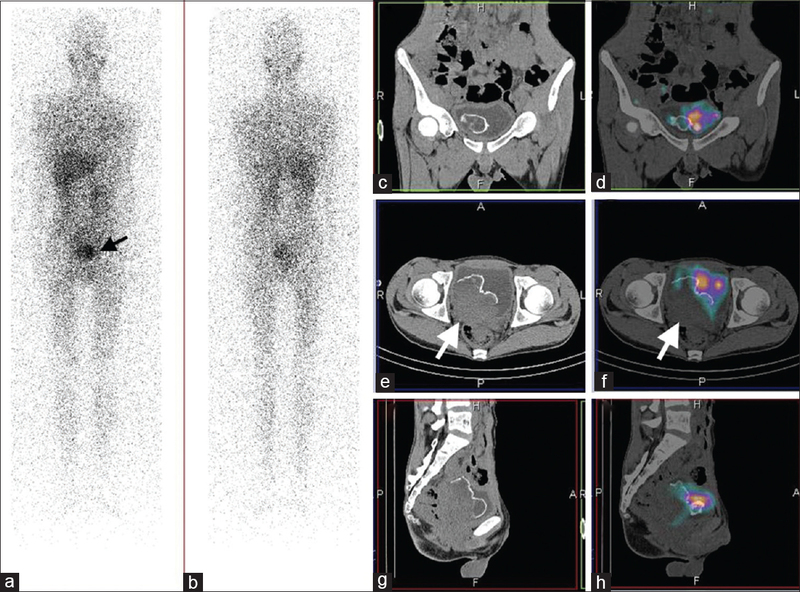 Fluorodeoxyglucose (FDG) positron emission tomography-computed tomography (PET-CT) scan is fast becoming a very useful tool in diagnosing and staging of several malignancies that affect the human body. We report three cases of ocular choroidal malignant melanoma, wherein FDG PET-CT scan did not show as good uptake as seen in other cancers. Brown tumor affects multiple bones in the body with variable clinical symptoms, which may be misdiagnosed as multiple bone metastases or primary bone tumor. In the present case report, we report the usefulness of 99mTc-MDP bone scan and 99mTc-MIBI whole body scan in differentiating brown tumor of hyperparathyroidism from giant cell tumor. 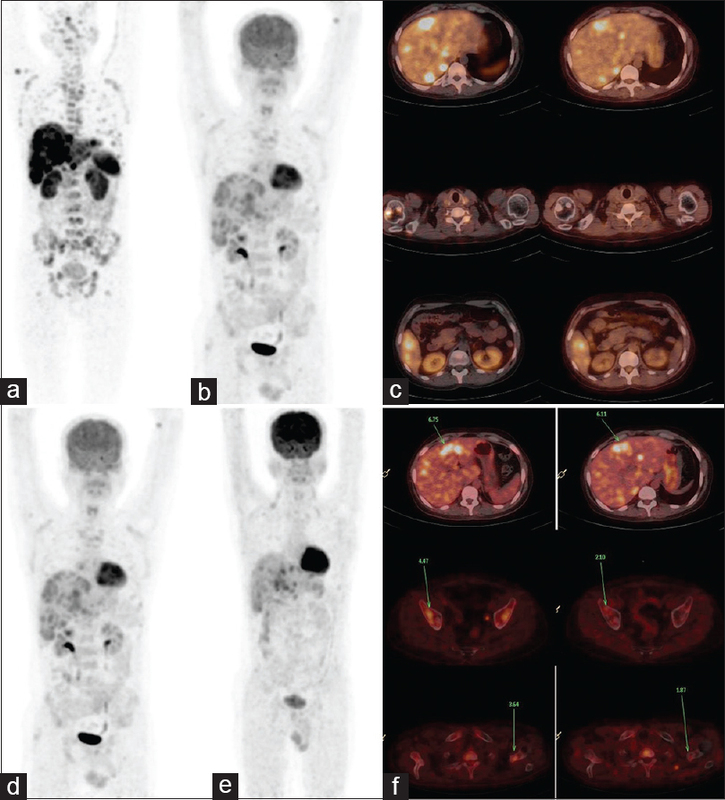 Heterogeneous patchy marrow uptake on fluorodeoxyglucose positron emission tomography/computed tomography (FDG-PET/CT) in a histologically proven case of lymphoma is usually considered a virtually pathognomonic sign of lymphomatous involvement. Here, we present a young male patient of T-cell-rich non-Hodgkin lymphoma (NHL), an uncommon morphologic variant of diffuse large B-cell lymphoma (DLBCL), who had undergone three sequential PET/CT scans at our department during the course of his therapy. These images depict the need for careful direct comparison of the current study with the previous PET/CT studies to avoid erroneous interpretation. This is a case of a 77-year-old woman who underwent a multiple-gated acquisition (MUGA) scan to evaluate her cardiac function after initially presenting with chest pain and shortness of breath. The scan revealed the presence of an apicoaortic conduit (AAC) and incidentally found a left ventricular pseudoaneurysm. After aneurysmectomy, the MUGA scan was repeated. Extraadrenal chromaffin cell-related tumors or paragangliomas are rare, especially in the bladder, accounting for less than 1% of cases. We report a 16-year-old boy who presented with hematuria and paroxysmal headache and was found to have a prostatic growth infiltrating the urinary bladder on anatomical imaging. 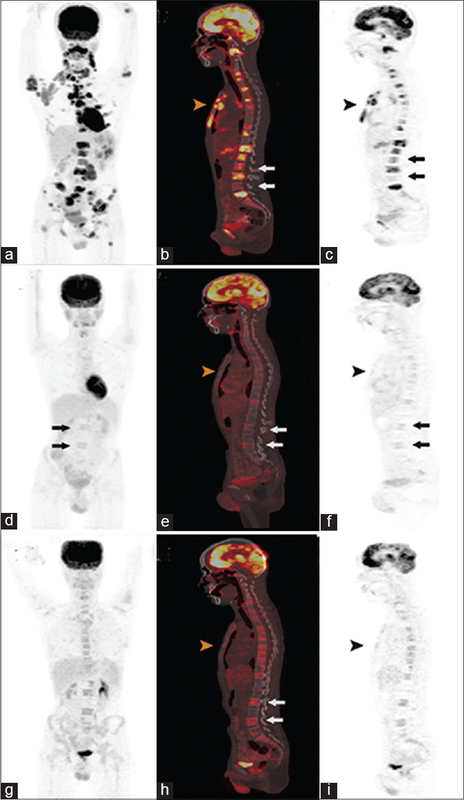 Iodine-131 (131I) metaiodobenzylguanidine (MIBG) whole-body scanning and subsequently gallium-68 (68Ga) DOTANOC positron emission tomography/computed tomography (PET/CT) were performed. The MIBG scan revealed a non-tracer-avid soft-tissue mass, while DOTANOC PET/CT revealed a tracer-avid primary soft-tissue mass involving the urinary bladder and prostate with metastasis to the iliac lymph nodes. He underwent surgical management; histopathology of the surgical specimen revealed a bladder paraganglioma, whereas the prostate was found to be free of tumor. Major vascular invasion is one of the worst prognostic factors of hepatocellular carcinoma (HCC). 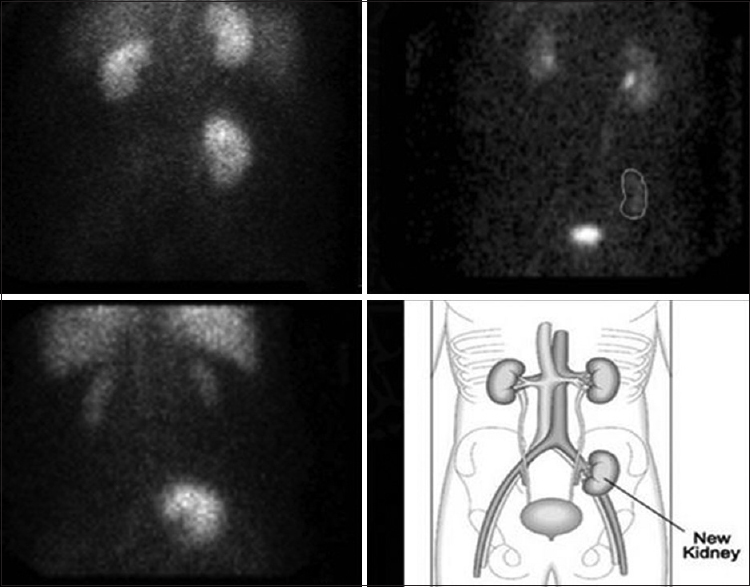 Fludeoxyglucose F 18 (18F-FDG) positron emission tomography/computed tomography (PET/CT) method is succesfully being used in HCC patients for the detection of particularly long-distance metastasis. Major vascular invasion is shown by radiological methods [particularly dynamic CT and/or magnetic resonance imaging (MRI)]. 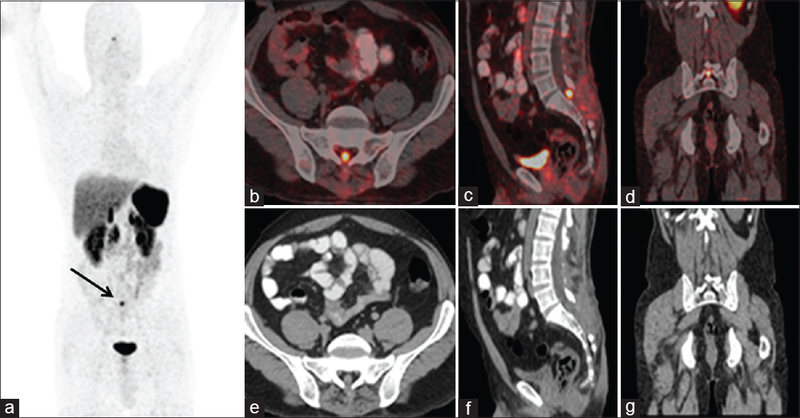 A male patient aged 60 years was diagnosed with HCC, according to biopsy after the detection of a mass in the liver. His medical examinations that were performed for the evaluation in terms of liver transplantation were dynamic CT and dynamic MRI; invasion in the intrahepatic branches of the portal vein and in main portal vein was also detected. PET/CT was performed to investigate the distant metastases. Moreover, diffuse 18F-FDG uptake in the intrahepatic branches of the portal vein and in the main portal vein was observed.